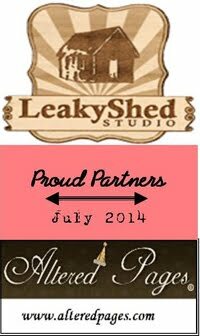 Hi, it's Tracey here with my first design team project using gorgeous Leaky Shed Studio chipboard. You may have noticed that we're playing with the fabulous and fun Julie Nutting Dolls. I have a lovely gift idea for you. Who doesn't love to receive a handcrafted decor piece? I used the Julie Nutting 4" Classy Doll as my focal piece on this sweet mixed media canvas for my niece. I cut two different patterns of coordinating paper to dress the doll skirt and painted the top in a coordinating color. 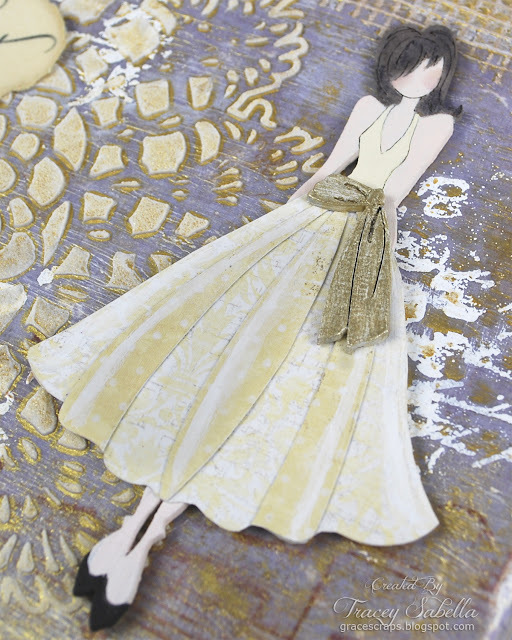 To give dimension and depth, I added highlights with gesso in the folds of the skirt. Her hair is colored with a Vintage Photo Distress marker, and I swirled two shades of gold metallic paint together to color her belt. I used flesh tone acrylic paint for her skin and added a touch of color to her cheeks with distress ink. Here's a side view of the canvas focusing on the girl. You can see how the metallic paint on her belt shimmers in the light! I adore texture and dimension and enjoyed getting messy fingers creating this textured canvas. I started by adhering gorgeous Maja paper to the canvas with matte gel medium, then brushed the gel medium across the top of the paper so it would hold up to my mixed media techniques. I stamped script, grid marks, and music notes in brown. 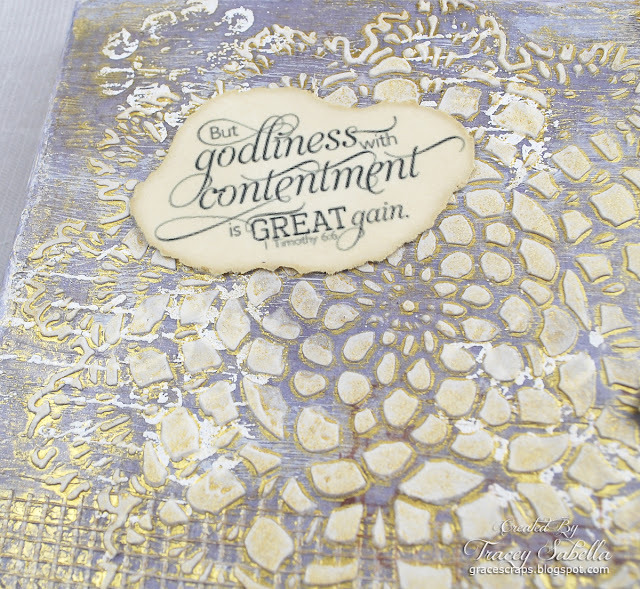 When that ink was dry, I stamped with more script and bubble wrap in white, sprinkled with white embossing powder and heat embossed. I cut a couple small pieces of sheet rock mesh for the corners, then used a doily stencil with light molding paste over top of everything else. 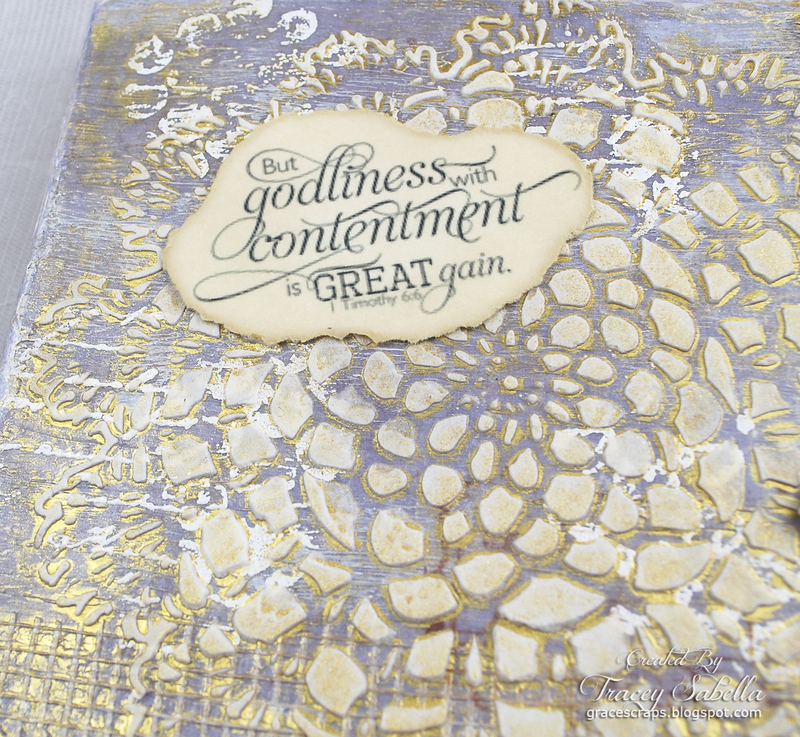 The sides of the canvas were painted in a coordinating color swirled with gesso. When dry, I spritzed the entire canvas with a gold mica laden mist allowing it to drip over and color the sides of the canvas as well. The mica adds such a wonderful, glowing shimmer. 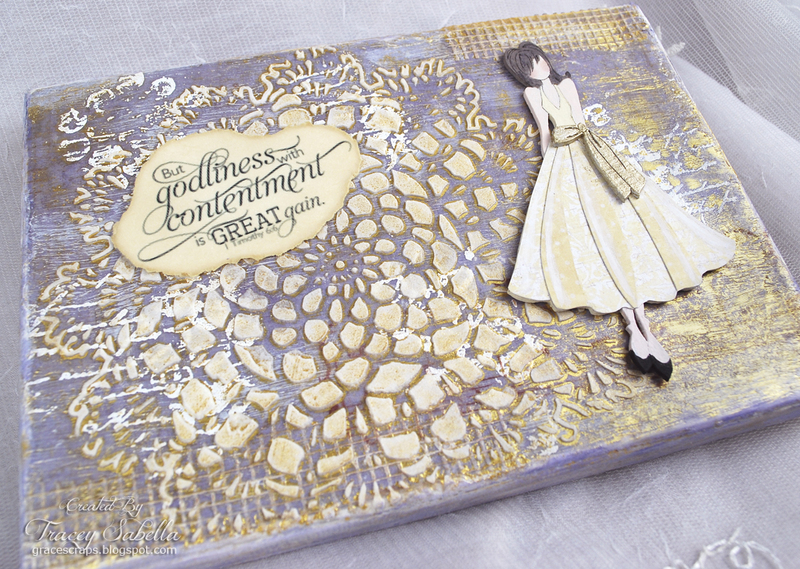 The sentiment, from Word Art Wednesday was sized and printed on white cardstock. I tore it out, rubbed on Distress Ink to color, then glued in place. Here's an angle that shows all the lovely texture. I hope you've been inspired to grab one of these sweet chipboard dolls and created a canvas for that special gal in your life!! I invite you to stop by my blog on Thursday for a full listing of other supplies used to create this canvas. Wow wow wow!!! This is gorgeous!!! LOVING the colors and the sash on her dress!!!! Higorjuss indeed, I love the sentiment too. Tracey this is just so gorgeous! The colors are beautiful! I'm just trying to take it all in!!!! The texture is absolutely gorgeous. This is absolutely gorgeous!! The texture and design are fabulous!! Simply fabulous! Thanks for the inspiration! Oh so gorgeous! Such great colors and textures! Gorgeous... stunning and I love your textures. Absolutely stunning! I would love to know the company that makes the doily stencil.